The Simrad TV80 program is the latest and most complete solution to show you all the information about your current fishing operation. Its flexible and intuitive design allows you to detect any changes or trends in the relevant data from the fishing gear and catch monitoring sensors. A quick look at the screen is enough. Several different presentation modes are available for data presentation, and with a large display you can bring them allup simultaneously. You can also work with a Dual Screen configuration, allowing you to handle more information without saturating the screen. In the TV80, the presentation of sensor data is organized in views. The views provide you with the information you need to control the functionality and the operational parameters. In the TV80, you can use a maximum of four views simultaneously. If you use less than four views, you can choose their layout according to your operational requirements or personal preferences. The quality of the acoustic communication link between the sensors and the receiver can be challenged by noise. When noise appears in the same frequency range as the sensors are using for their communication, the resulting informationmay be unstable or unreadable. 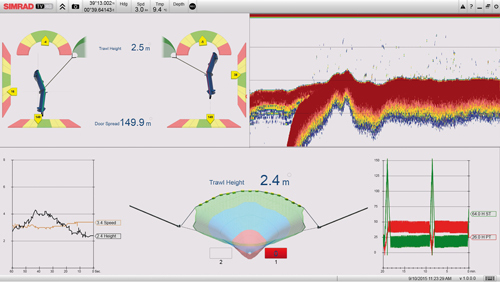 The TV80 offers a spectrum analyser that shows you the signals from each hydrophone. The graph in the Spectrum dialog box provides you with information about the background noise and the signal strength in the selected frequency band. With this information you can identify noise and find the "cleanest" frequencies.